Versailles’ Keaton McEldowney, left, moves down the court followed by Sidney’s Ratez Roberts at Trent Arena in Kettering on Sunday. Sidney junior forward Andre Gordon shoots during a game against Versailles on Sunday in Flyin’ to the Hoop in Kettering. 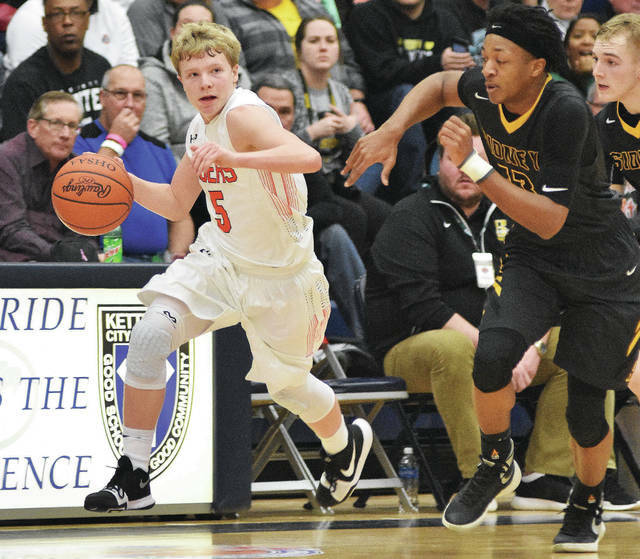 KETTERING — Justin Ahrens knows the recruiting process is a lot of fun. But it can be stressful, especially in the middle of a season. And that stress is why Ahrens respects two-sport athletes like Sidney junior Andre Gordon even more. Gordon’s basketball recruitment may have gotten a boost on Sunday in Flyin’ to the Hoop at Trent Arena in Kettering. 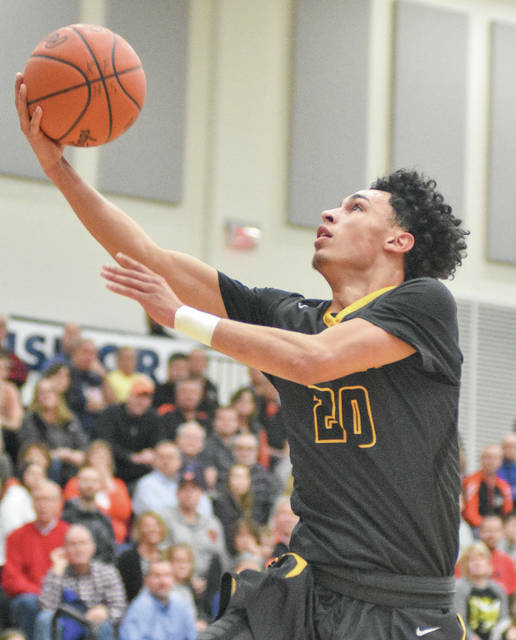 He scored 20 points and had three rebounds in Sidney’s 65-50 loss to Versailles. The annual Martin Luther King Jr. Day weekend tournament has become a basketball convention of sorts for Ohio. Flyin’ to the Hoop features some of Ohio’s best players and top collegiate prospects each year, as well as some of the top prospects and prep teams nationally. And with top teams and prospects come college coaches. Several Division II and III coaches were in attendance on Sunday, as well as Xavier coach Chris Mack. Mack and the Musketeers are one of several large Division I programs recruiting Gordon that haven’t extended offers. Gordon plays for the prestigious All-Ohio Red AAU program in the summer and said he’s used to playing in front of a plethora of coaches — as many as 15 or 20. He said he’s heard from a lot of coaches since his junior season began. “It’s kind of amazing,” Gordon said. Gordon, a 6-foot-1 guard, has gathered several offers from MAC and Horizon League schools, including Kent State, Cleveland State, Toledo and Wright State. He’s also received offers from Iowa State and Toledo for football. Gordon, who plays at quarterback for Sidney’s football team, said he hasn’t decided what sport he wants to play in college and is open to offers in either. Among other football programs he’s been contacted by is Ohio State. Ahrens, who signed with Ohio State for basketball in November, said he and Gordon are friends. Both were on Ohio State’s campus for a basketball visit on Oct. 28 when the football team played Penn State. Gordon struggled in the first half on Sunday and sat on the bench for several minutes after picking up two quick fouls. As happy as Ahrens was that Gordon wasn’t playing well early and Versailles was, he said he didn’t want Gordon to fall flat. “Obviously he came out struggling,” Ahrens said. “Quick fouls are something hard to overcome as a player. You’ve got to be mentally prepared for that because those games happen. You’ve just got to learn it’s not what happens during the game, it’s how you bounce back. I feel like he bounced back well, and I’m happy for him. Gordon, who guarded Ahrens for most of the game, scored 16 points in the second half. He finished shooting 10 for 23 from the field and brought down three rebounds. Versailles (11-1) went on a 9-2 run early in the second quarter to take a 23-9 lead over Sidney (7-4) and led by double digits for most of the rest of the game. Ahrens scored 11 of his game-high 26 points in the second quarter to help the Tigers jump out. Versailles coach Travis Swank said he thought fans in attendance on Saturday got to see a good matchup between the two. “Both of them are elite athletes, and I think everybody got to see their athleticism,” Swank said. “Gordon is hard to stay in front of. He’s really worked on his shot. We scrimmaged him last year and I think he’s really improved. That’s going to take him a long way as far the Division I level goes. In whatever spot he goes, because I’m sure he works just as hard at football. This entry was tagged Andre Gordon, basketball, Chris Mack, Cleveland State, Division I, Flyin’ to the Hoop, high school, Iowa State, Justin Ahrens, Kent State, Kettering, Sidney, Tigers, Toledo, Travis Swank, Trent Arena, versailles, Wright State, Xavier. Bookmark the permalink.